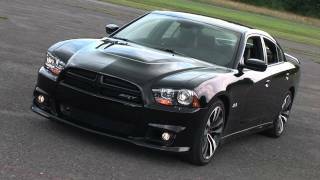 July 15, 2011 ,Auburn Hills, Mich.-	The Dodge Charger SRT8® makes a return to the performance car market in 2012 bringing intelligent performance features and more power to the brand’s iconic four-door fastback coupe. New for the 2012 Charger SRT8 is the 470 horsepower 6.4-liter HEMI® V-8 that features 45 more horsepower and 50 more lb.-ft. of torque across a significantly wider rpm range, new exhaust system technology for improved fuel efficiency, along with new paddle shift technology and adaptive damping suspension for optimal driver control. Even with the elevated power numbers, a 21-percent fuel economy increase (up to 23 mpg) on the highway is achieved by use of a new-for-2012 active valve exhaust system that allows the standard Fuel Saver Technology (four-cylinder mode) to engage over a wider rpm range for improved efficiency or the use of all eight cylinders when the extra power is needed. The new active valve exhaust system also allows for straight through mid and rear mufflers for a throaty exhaust note under engine load. The 2012 Dodge Charger SRT8 features an active intake manifold and high-lift camshaft with cam phasing to provide maximum low-end torque, including an additional 80 lb.-ft. of torque at 2,900 rpm for strong standing starts while optimizing high-end power. In “Drive,” the transmission controller will automatically shift the vehicle. The aggressiveness of the shifting is defined by the mode chosen - either “Normal” or “Sport.” Fully adaptive electronic control of all shifting makes the powertrain more responsive while minimizing harshness. A standard adaptive damping suspension (ADS) system is new for 2012 and tuned specifically for the Dodge Charger SRT8. The ADS system uses a wide range of on-road and driver inputs, such as vehicle speed, steering angle, steering speed, brake torque, throttle position and lateral acceleration, to automatically tune the suspension for specific conditions. When drivers manually choose between the “Auto” and “Sport” settings, the shock damping characteristics are quickly changed from an everyday performance ride to a much firmer race track capable damping for more challenging driving situations. Maximum handling rating for the 2012 Dodge Charger SRT8 is .88g on the skidpad. New, split five-spoke, 20 x 9 inch lightweight forged and polished aluminum wheels with black painted pockets provide great looks, and the available three- or four-season tires make the 2012 Dodge Charger SRT8 easy to handle and fun to drive in any condition. 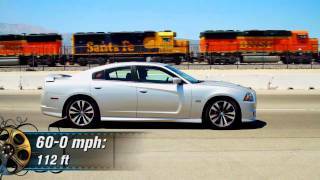 The 2012 Dodge Charger SRT8 can stop on a dime. World-class stopping power from 60-0 mph in 120 feet comes through 14.2 inch (front) and 13.8 inch (rear) vented/slotted rotors with four-piston Brembo calipers painted red. Improved brake cooling and fade performance at all four corners comes courtesy of a new underbody belly pan with integrated brake ducting. A new for 2012 performance-sculpted hood features a black air exhauster for added engine cooling. Exterior paint color choices for 2012 include Black, Bright Silver, Bright White, Redline Red and Tungsten. Unique side-sill cladding is painted to match the body color. In the rear, the Charger SRT8’s new signature “race track” taillamp design with 164 illuminating LEDs sits just below a new rear spoiler. New 4-inch round dual exhaust tips are positioned inside of the new rear fascia while the SRT8 decklid badge boldly shows the Street and Racing Technology DNA. An all-new, leather-wrapped, SRT-exclusive steering wheel features a unique satin chrome rim section with a flattened bottom surface that showcases the SRT logo. The standard paddle shifters flank both sides of the new steering wheel behind the new contoured palm rests. For the high-performance look, Dark Engine Turn fiber aluminum interior trim pieces are integrated into the new instrument panel and shifter bezel. Both front seats have unique, aggressive bolstering under the Nappa leather and Axis perforated suede insert fabric to help “grip” the driver and passengers, keeping them in place during spirited driving. Front seats are also heated and ventilated and have the SRT logo embroidered in the seat backs. Reactive headrests are standard. Modified door trim panels feature unique bolster material that matches the seats. Interior color combinations include black, and new for 2012 Radar Red/Black, which adds color to the seats, door trim panels and center console cover. Passengers in the rear also benefit on cool days with heated rear seats. The new full-color graphic Electronic Vehicle Information Center (EVIC) with exclusive Performance Pages includes timers for 0-60 mph, one-eighth mile and quarter-mile times, 60-0 braking distance, along with lateral and longitudinal g-forces within the touchscreen display. The new instrument panel’s 8.4-inch color touchscreen display – the segment’s largest standard display – also has all the same Performance Pages data as the EVIC, and is further expanded to include steering angle, horsepower and torque outputs along with engine gauges. The display is customizable to a driver selectable background. In addition, standard front-row reactive head restraints, standard full-length side-curtain air bags, driver’s knee air bag and standard front seat-mounted side-thorax air bags offer enhanced occupant protection to passengers in the event of a collision. The available Driver Confidence Group adds Blind Spot Monitoring, Forward Collision Warning, Rear Cross Path detection and SmartBeam® headlamps. New for 2012, the Dodge Charger SRT8 features a standard 900-watt, 19-speaker premium SRT performance audio surround-sound system from Harman Kardon®. The system offers world premier innovation, featuring a 32-volt TPS (Tracking Power Supply) 12-channel Class D amplifier that delivers outstanding acoustics and brings multi-dimensional, quality sound for all interior occupants. The intuitive user interface for the system is controlled through the state-of-the-art Uconnect® Touch on the largest standard touchscreen display (8.4-inch) in the segment. Benchmarked against the best E-segment sedans from Europe, Asia and North America, the easy-to-use system also features Uconnect Voice to deliver world-class functionality to keep all passengers easily connected, comfortable and secure. The Uconnect Touch system has been upgraded for 2012, adding handsfree texting with compatible Bluetooth devices, voice commands for Garmin® navigation, SIRIUS Traffic and more iPod® control features to expand on the system’s connectivity and convenience technologies. Safety and ease-of-use is a priority, and the upgraded Uconnect Touch 8.4 and 8.4N models with handsfree texting keep passengers even more connected through voice commands. With a compatible Bluetooth® phone, Uconnect Touch enables text-to-speech for incoming text messages and provides the driver with recorded speech-to-text responses for outgoing messages. The 2012 Dodge Charger SRT8 will be built at the Brampton Assembly plant in Brampton, Ontario, Canada. Dodge is a full line of cars, crossovers, minivans and SUVs that are agile, daring, sensible and inventive. The brand is on a tear for the 2011 model year, redefining itself with six all-new or significantly redesigned new vehicles, actively participating in new events and sponsorships and developing relationships with its long-loyal enthusiast base, as well as reaching out to customers who want cars that leave them wanting more.